Twinkle in this trendy two-piece sequin homecoming dress from the designers at Blush. The stunning off-the-shoulder crop top on this short party dress features a sweetheart neckline and supportive thin spaghetti straps. A figure-defining band at the natural waist crowns the curve-cradling pencil skirt. 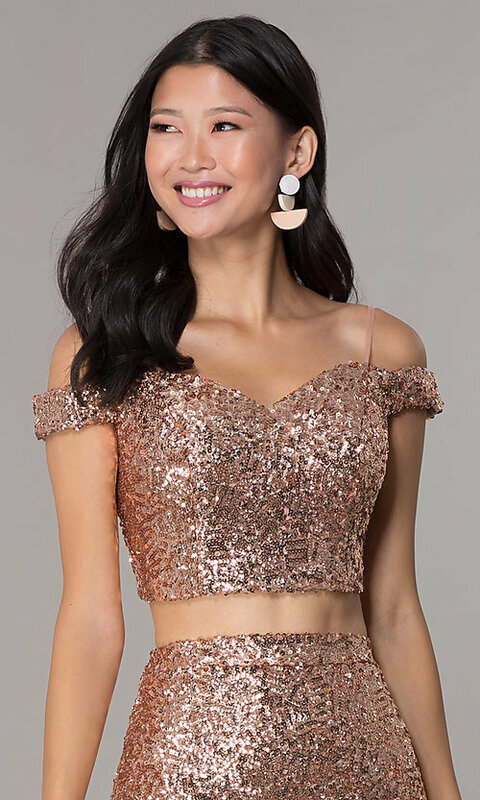 Ideal for highlighting your unique personal style at hoco 2019 or a family celebration, this shimmering semi-formal party dress is sure to impress. For a radiant look, slip on this two-piece off-the-shoulder sequin homecoming dress and get the party started with confidence.